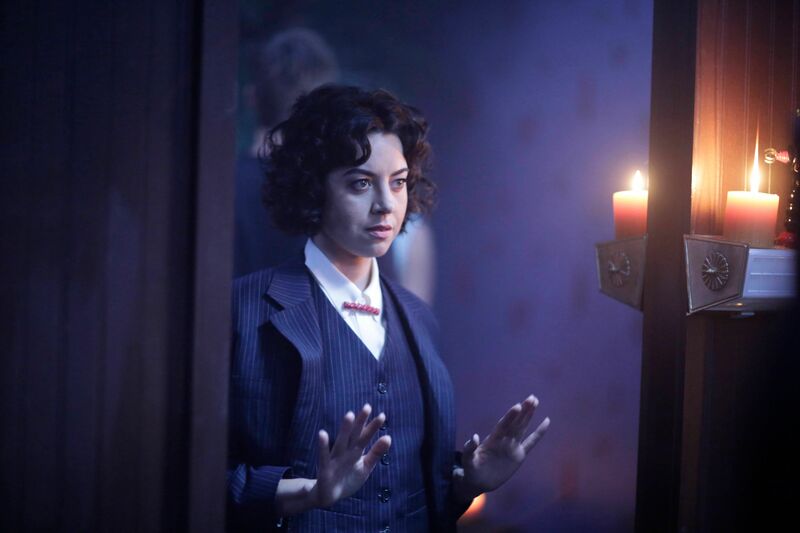 The Devil with the Yellow Eyes finally spoke directly to David on Legion last night — through the visage of Aubrey Plaza’s Lenny — and fans can now be pretty certain as to the identity of the show’s bizarre villain. Spoilers follow for FX’s Legion. Equating the Devil with the Yellow Eyes with a parasite is apropos, but fans want more. They’ve been hunting down comic book sources for identity clues since the bloated, decaying, parasitic, psychic entity first reared his ugly face. Some thought it might be Proteus, son of Moira MacTaggert, with reality warping and possession powers. Others considered Mojo, who bears a striking resemblance, and though a villain associated with a myriad of powers, none of them really included psychoparasitic possession. But let’s stop speculating: In an alternate promo for next week’s “Chapter 7,” Cary straight-up namedrops him: Amahl Farouk, aka the Shadow King. Amahl Farouk is an Egyptian psychic possessed by an entity known as the Shadow King, which sounds a lot like David’s current position. For Legion, it appears the two might be considered one in the same. In the comics, Farouk psionically assaulted Charles Xavier while the famed telepath was touring Cairo when he was but a mere rich academic. Xavier fended off the attack in a battle on the astral plane. The confrontation rendered Farouk’s bloated body useless, trapping his psychic projection in the astral plane (which is not unlike what happened to Oliver Bird). Xavier obviously went on to form the X-Men some years later, and perhaps in the Legion timeline, sire and hide his son. The Shadow King is considered a “multiversal manifestation of the dark side of the human consciousnesses, spawned by the first nightmare.” Though Farouk is sometimes considered just one of many hosts that the Shadow King inhibited, the names are used interchangeably throughout canon as the entity possessed various mutants and harassed Charles Xavier time and time again. It’s especially worth noting that the Shadow King did actually possess Legion, our very own David, in X-Factor Vol 1 #69. It might still be accurate to call the Shadow King a malevolent psychic entity rather than a mutant; to him, mutants are tools to possess and use for his own ends. It remains to be seen exactly what those ends might mean for David and his friends, but it can’t be good if he gets full control over David’s vast array of powers. Legion airs Wednesdays on FX.